RegMerge, a Bitsum freeware project, has been updated to v0.0.2.1 ALPHA to fix a parsing error in some .REG files. RegMerge is one of many projects I started, but left to linger because I didn’t see sufficient user interest at the time. That appears to be changing, so I’ll make sure the product is worthy of distribution ASAP. After all, it’s a relatively simple freeware project. In general, here at Bitsum, you are going to find early releases of experimental software in the hidden corners of the site, and in every case of such, a huge warning is presented to you when you run the application. That means something! It means the software isn’t finished and hasn’t been through our QA processes. 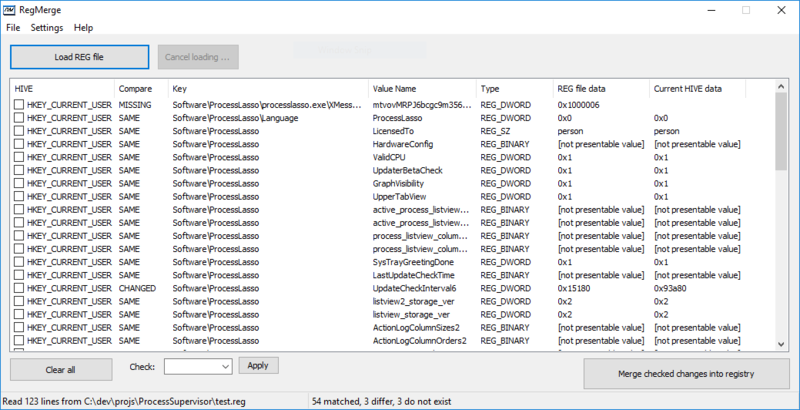 For instance, you can be sure Process Lasso v8 is stable and works well, because it is a ‘release’ version. Early ALPHAs or even BETAs are just not to that level yet. If you want to see any particular project move from ALPHA to FINAL, let us know that you have an interest in that project!